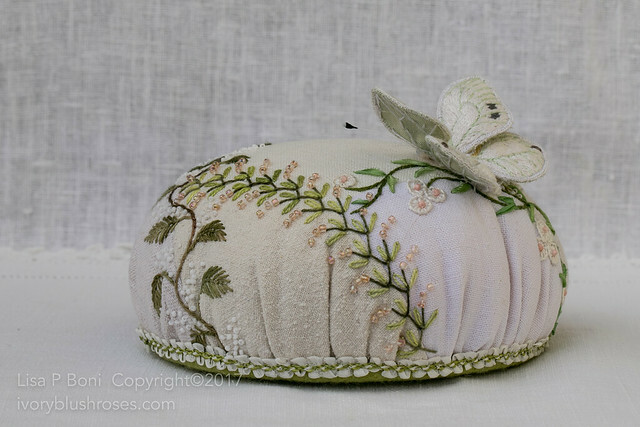 Ages ago, I started working on this pincushion. The piecing and embroidery progressed quickly, and the butterfly got off to a good start. 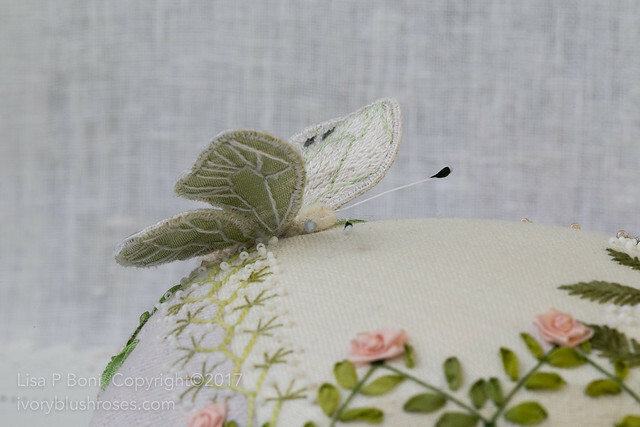 But then as it came time to do the teeny tiny buttonhole stitches around the wired wings, things slowed down. My aging eyes certainly don't work as well as they used to! 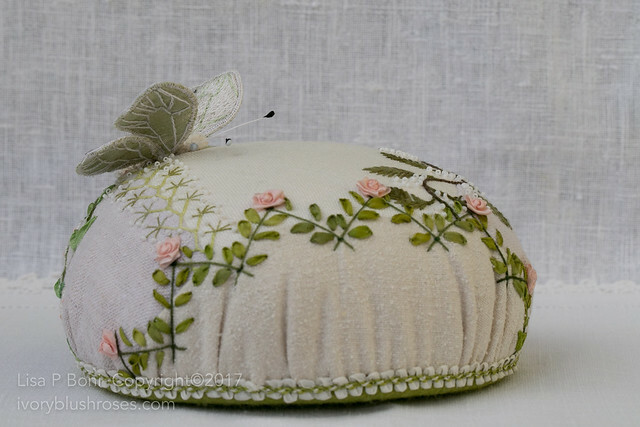 But a new Ott magnifier light made all the difference and this little butterfly finally got finished and now sits on her pincushion! 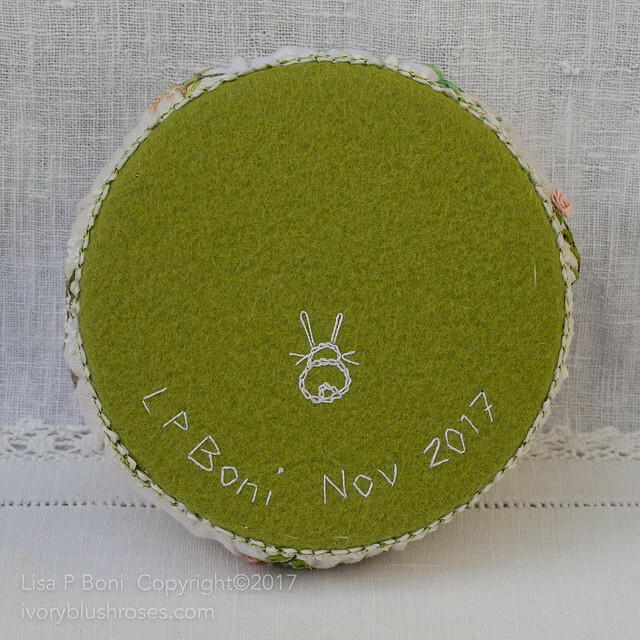 I've done so much stitching in the past couple of years that has fallen outside of my comfort zone and so I wanted to do a pincushion for myself in my favorite colors and fabrics. The linen and silk fabrics came from an assortment of old skirts of mine and bits of new yardage. 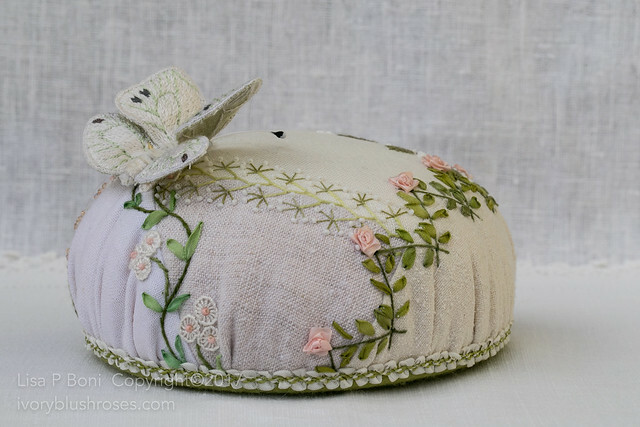 Then I added stitching in my favorites shades of green with touches of white and pale pink. I've always loved the little white butterflies that visited the garden. Pale green underneath and lovely white on top ~ my favorite colors! And if you get a chance to look at them up close, some of them have the palest blue eyes! 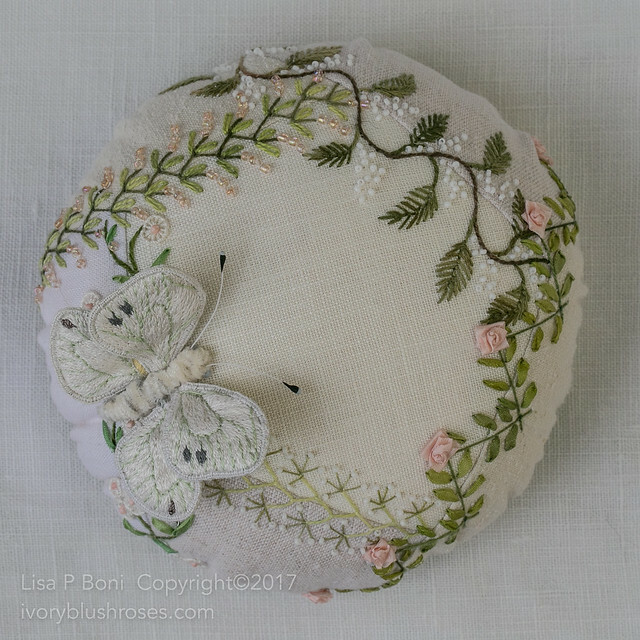 Though my butterfly is a bit larger than the tiny visitors to my past gardens, it sits perched just as lovely above the embroidered foliage! Completing a project like this makes me happy! Will I use it as a pincushion? Probably not! More likely, it will sit on my shelf to brighten my day! Creating the butterfly's body was the hardest part for me. 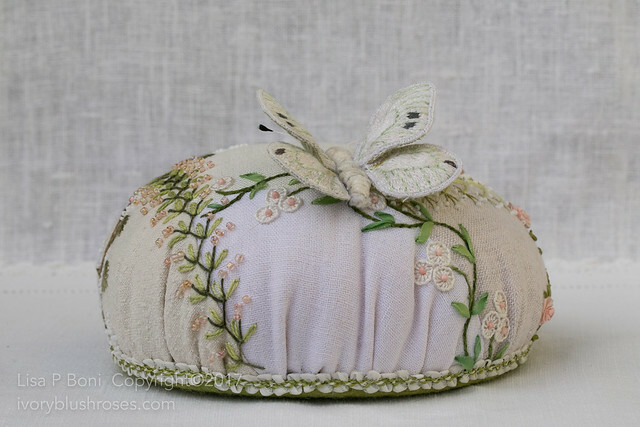 In the end I used a bit of felt and stitched and wrapped some silk chenille around it, incorporating the flower stamen that became the butterfly's feelers. It turned out a bit larger than anticipated, but still lovely! It's good to be stitching again. Hoping to spend the remainder of this year getting some other old projects finished before starting on some new things! 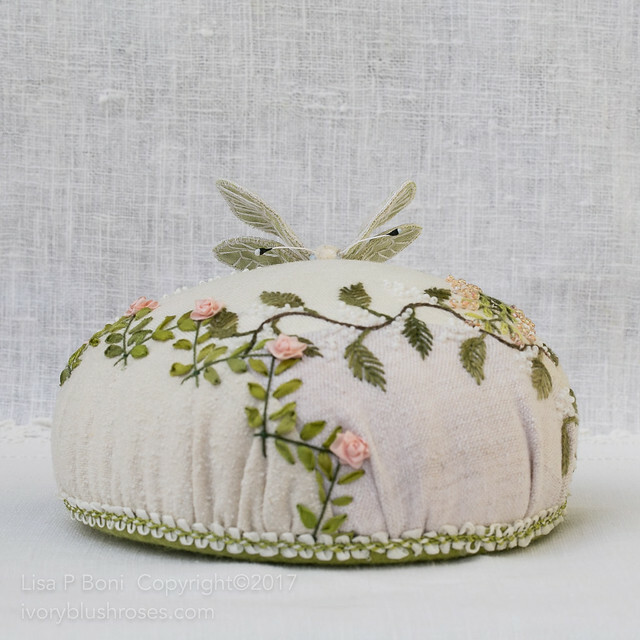 I think this is the 39th pincushion that I have made! What a lovely little thing!!! Oh my goodness Lisa. 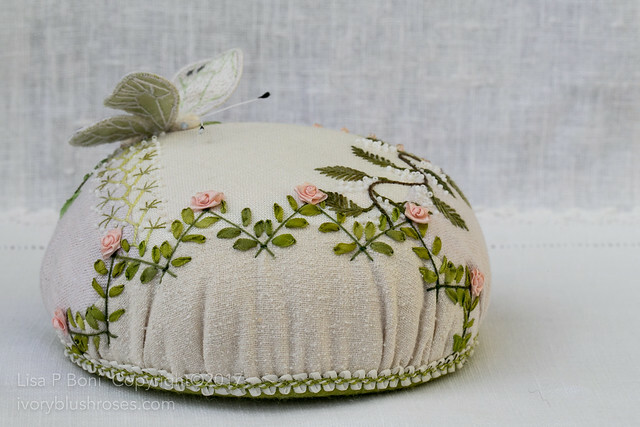 This has to be one of my very favorites of your pincushions. It is so pretty and makes one smile just looking at it. You did a beautiful job. My pincushion that I won from you is filled with pins and needles. It is a joy to use and makes me think of you. Lisa it's really elegant! Are you stitching this in your RV! As always, your work is beautiful. Lovely colors and so well photographed. Thanks for the inspiration. Hi Lisa. Beautiful hand stitching on that pin cushion. So pretty. I admire your talent and enjoy reading your blog. Hope you are better since you retired. I hope that you have less stress now, and are able to live easier. Pain is a thief of joy sometimes. But maybe being able to stitch more, will add more to your life in better ways. You sure make some lovely things. Thanks for sharing. 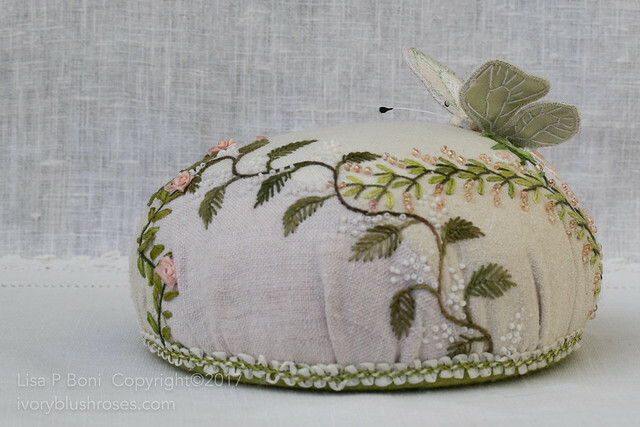 Your new pincushion is lovely as usual. I was wondering if you actually used these as pincushions or "just for pretty". Lisa, you do such beautiful work! This is stunning.